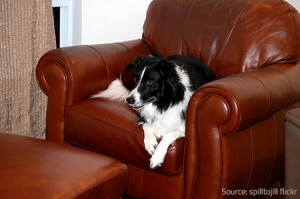 Allure your pets away from your furniture! 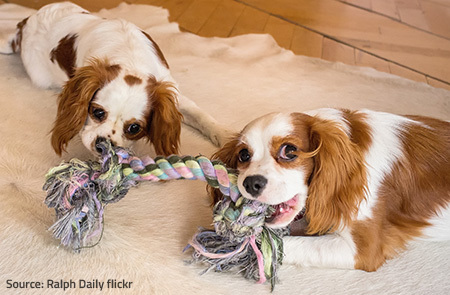 Christmas is approaching, so have you decided yet what present to buy for your pet? Without a doubt, you already know that your beloved animal companions deserve adventurous options to exhaust their energy and attract their attention. If you have any second thoughts, just remember what your curtains looked like last time you were away and your daughter’s kitty got too playful. Or when despite the efforts of their well-behaved mother-dog, all her four puppies decided that chewing the chair legs was the best possible exercise for their new teeth… Or when your own toddler and these same puppies turned your entire house upside down by playing “catch me if you can”? So, the Christmas present – an indestructible snake toy to provide hours of “hunting” entertainment for your dog or a scratching post in an attempt to allure your cat away from your upholstery or a sticky tape to discourage pets from climbing up and down your sofas and armchairs? Or perhaps, taking into account the scale of the damage, a new set of furniture? Actually, no need to worry – the bill for hiring a furniture restoration specialist is quite affordable and besides, most minor damage can be easily repaired on your own. So, don’t get too angry with your playful pets – while you should certainly try to teach them manners, don’t forget that more often than not their mischievous behavior is a sign of loneliness, frustration or anxiety. Find out how to keep these special friends of yours happy and not to waste too much money and nerves on all the eventual damages they caused to your expensive furniture. The chair legs look very tasty to your furry friends. While a furniture restoration company will manage this problem with great professional skills and enviable speed, it’s quite possible to restore the former condition of your furniture on your own with the right approach and technique. You may need to buy or assemble a pet damage repair kit to cope with the situation. Although the task is relatively long and tedious, your furniture can be refinished so well that only you and your mischievous pet know about the damage. All the work done properly, your chewed wooden furniture will have a flawless finish and should look as if recently purchased! Peace can turn into chaos in split seconds! It is less likely to be chewed on but is definitely more prone to scratches than any other piece of furniture. However, if the scratches have not cut the leather apart, it becomes much simpler – just apply adequate leather balm and the damage should be sufficiently repaired. Deep cuts through the leather, on the other hand, require furniture refinishing. Only professionals can save badly damaged leather. It is not as expensive to replace but with little effort you can repair it yourself. The best solution is using iron-on fabrics that are easy to find and cheap to buy. Iron them on the back of your torn fabric to patch it discreetly. Or you can use your imagination and create unique colorful furniture upholstery! In such cases, you will need to remove the odor and also to clear the stain for proper furniture restoration. A great variety of cleaning products that work on both cloth and leather is available, so choose what best fits your needs! You could also try a home-made remedy by mixing baking soda, liquid soap, hydrogen peroxide and vinegar to remove the odor. However, this will not work for stains. Carefully apply a light layer of fabric paint to stained or discolored fabric spots with a cotton bud or a clean sponge to repair the damage. Don’t forget to wash whatever is possible! Try your best to restore the gorgeous look of your furniture; even if your efforts fail, you still have the option of hiring furniture repair services that offer quality refinishing work. Sweet kitty seems to be on display… till the moment she decides to jump! 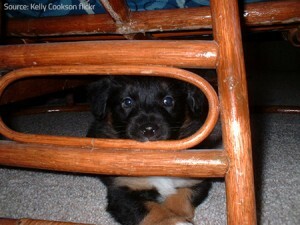 Smaller pieces of furniture are often severely damaged when toppled down by running pets. The chaos in your home may vary from ripped wallpapers and curtains to broken chairs and night stands. 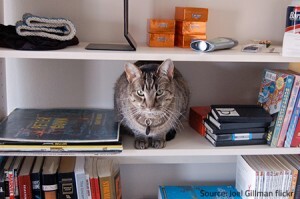 Book shelves, for example, are a favorite for cats to climb on and can often end up being knocked over. 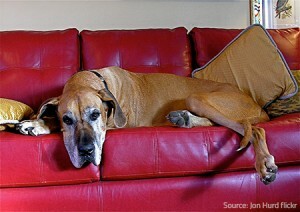 Large dogs are strong enough to substantially harm your furniture when their excessive energy is released. Even a parrot let out of the cage can break your lamp. Repairing broken furniture legs or corners is a doable task if you have the right tools and skills but if you don’t want to lose a severely damaged piece, you’d better leave it to the experts. Instead of coming up with clever ways of furniture repair and restoration, you’d better concern yourself with your pets’ habits and try to prevent damage. 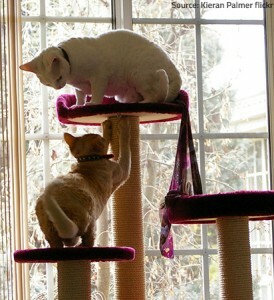 It is not exactly easy to protect your furniture, but if there is a will, there is a way! Happy pets will raise your spirits! Maintain the good hygiene of your animal companions and feed them healthy quantities of quality food. Do not forget to award them with little treats every time they behave well! Supply stimulating toys that will intrigue or comfort your little friends. Provide sufficient physical exercise because your pets need to exhaust their energy but also play with them often to show how much you care and cherish the enjoyable moments together! A dog is a man’s best friend, but definitely not furniture’s preferred companion. And while they say that “home is where my cat is”, try to make your pet feel at home without causing any damage to your belongings.